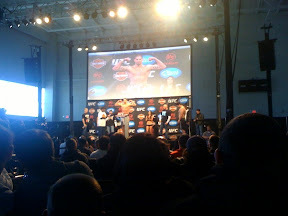 Here's @BrendanSchaub on the scale. The Q&A went very well with Mike Goldberg and me. Thanks to all the fans that showed up! I can't wait for our guy's fights! Eliot, Duane, Brendan, Jon and Clay all look good and ready for their fights!